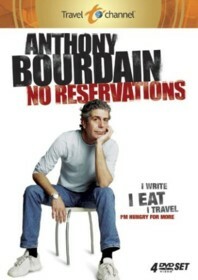 Anthony Bourdain: No Reservations is a television show in the Travel genre starring Anthony Bourdain. The tv show first appeared on air on 2005-07-25. Our users found the overall impression of this television show to be Educational. The tv show's official site can be found at www.travelchannel.com/TV_Shows/Anthony_Bourdain. I started watching Anthony Bourdain on FoodTV a long time ago and then one day on Travel Channel I discovered this show. Anthony is a world renowned chef who not only wants to learn about new food and show his viewers that food, but also shows us all these wonderful places. Anthony also has a nice sarcastic sense of humor and he really seems to know how to get the viewer to appreciate the beauty and honesty of local cuisines. Bourdain also seems to know how to best show off his destinations as well and his show becomes a visual treat as well.